I realized I was so chatty in this video that you probably will learn all about this hike by watching the video! The new setup with the phone worked better than the GoPro but I do need to remember to keep the same horizontal orientation throughout so please pardon the switches to the vertical shots. I’ve almost got this video thing down! 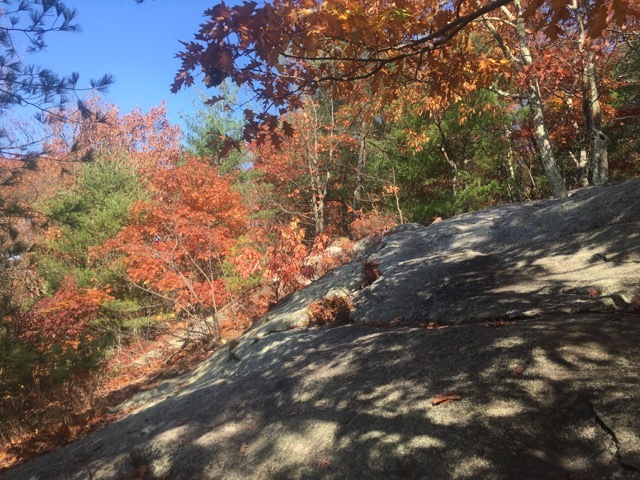 I know I’ve covered this section before but it was not a great quality video… This hike was a windy and wonderful Veterans Day, and I got to cut my first blowdown! Thanks veterans for your service. This time of year, especially before daylight savings time kicks in, the sun sets by 6 and doesn’t rise again until 7. That is a LOT of time alone in a tent. I love having time to think, and I do a lot of it while I walk the long miles. But I often look forward to company at a campsite. It’s just in my nature and one reason I like it when I’m assigned to look after a campsite for the night. I love interacting with other hikers, or family and friends and sharing stories of our adventures or just riffing on the topics of the moment until bedtime. I admit I get a little lonely when I have 20+ hours to myself. I don’t need THAT much time to think things through. The places I had planned to hike and overnight were particularly remote and it was unlikely I’d have anyone to talk to. I’m a social person at heart. Also while it was unseasonably warm for November, this can be a cold and wet time of year to hit the trail. That just comes with the territory but when you have the choice, why subject yourself to discomfort if you don’t have to? At the higher elevations I was considering there was a good chance of nighttime temps being far colder than those forecast at ground level. I’ve been out in my tent when temperatures dropped into the low 20’s and it was not comfortable. Though it was certainly an adventure I came out of feeling stronger and more skilled in the backcountry. There was a forecast for rain and that could mean snow on a mountaintop. I don’t really do winter overnights yet. That could change I suppose. I guess I’m best suited for the section hiker title. I have my dreams of doing a thru hike, but that’s something I can’t even consider at this stage in my life with work and family demands and schedules. So I ( & we) enjoy day or multi-day outings to cover the trail bit by bit. I would like to try to spend a whole week or two on the trail at one point, as I know it will provide a lot of time to process things in my life and really connect with nature. I certainly feel shortchanged on day hikes sometimes, as I was just getting into it when I had to leave the trail. But I think a week would be a good experience and also mean I can cover longer sections of trail. A few years from now, I should be able to make that kind of time available. But for this instance, I was happy with a day hike and and then some creature comforts with my partner and best friend. We drove up both of our cars and spotted the first at the end of the section, and then drove to the start where we last left off on Homes Rd. We still had a climb ahead of us but the last one left us atop June mountain, which accounts for half the climb from the valley below. 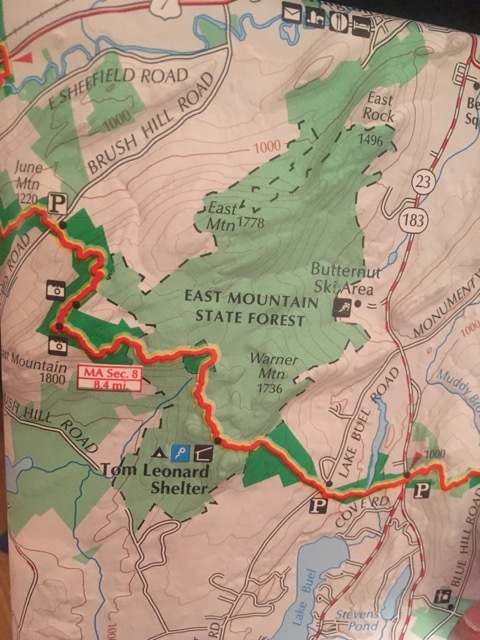 The trail climbed quickly up the western slopes of East Mountain. We crossed a bridge over a little channel in the rocks which I imagine is sometimes filled with water. Not today; it’s been a very dry season until recently, and that’s not been enough to get everything flowing again. We scrambled up a rock face that reminded me of Harriman in New York. We then began getting views of the Taconic range through the trees as we reached the ridgeline we’d be traveling for the next few miles. 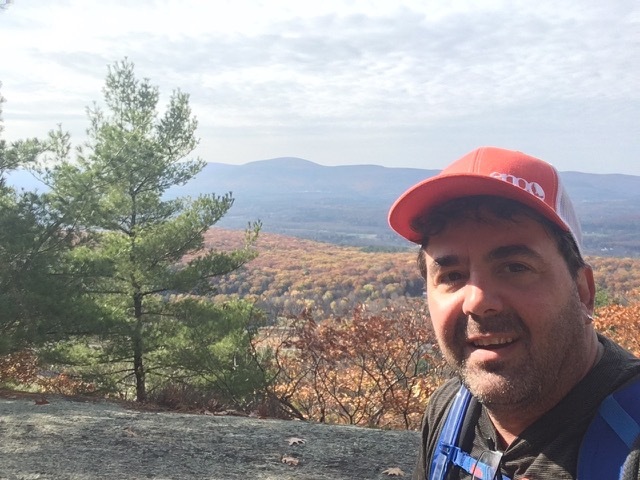 About 2 miles in we reached a large rock outcropping with full views of Mt Everett north to Jug End as well as Alander to Catamount on the ridges to the west. This outcropping, while you can climb up on it, is a big smooth slide that you wouldn’t want to roll off as it will send you right off the cliff. So use caution when having a seat up there. We took a break here to shed some layers as the sun was up now and the day was heating up to the mid-60s forecast. Onward we went along the ridgeline, with occasional views now south and easterly. We arrived at another opening in the treecover where a rock outcropping provides a great view of the pond in the valley below and the Litchfield Hills just over the Connecticut border beyond. You could see the eastern shoulder of the mountain we had climbed and it was painted a bright orange in full fall glory. We met a local hiker and his dog, Everett, who was named after the mountain! We had a snack and he snapped a great photo of us. Turns out he grew up in our town — small world! A few other day hikers with their dogs came up as we were heading out and we made our way back along the ridge in search of the Tom Leonard shelter. We crested the summit and headed back down into the saddle between East and Warner Mountains, which we would not officially summit as its peak is to the north of the trail. You know I wanted to peakbag another summit, but it was not in the cards today! On the north side of this landmass is a favorite ski resort where I and my kids learned to ski – Butternut. It was originally named Butternut Basin in the 60s when it opened, and that’s named after the large basin between the summits that we were about to pass by. Also for the Butternut trees. We passed the time talking through important issues in our present lives, as well as trying to identify any Butternut trees in the area of the basin. It wasn’t until we finished our hike that we saw a photo online of the leaves. We had not found any. But the basin itself was an interesting change in ecology that was noticeable as we passed by it. We crossed another trail which looked like an old fire road or narrow mountain road. It likely goes down to the wildlife management area to the south, and may also be an access for hunters. Not sure. There is a tower of some sort atop the mountain so my first guess is its a fire access or mechanical access road. We finally reached the shelter. We had thought it would be much closer to the middle of the hike but its actually about 2/3 of the way in, just before the ice gulch. We saw the sign as we crested a large rock outcropping and wall. The shelter could be seen below and I of course wanted to go check it out. Fielden took a break at the top of the rock ledge while I walked down to the shelter, which was nestled between another ledge on a plateau, with the mountain’s edge falling away a few hundred yards south. It was a glorious shelter, with bunks for four and then room for another 6 on the overhang. There’s a plaque on the back about its construction. 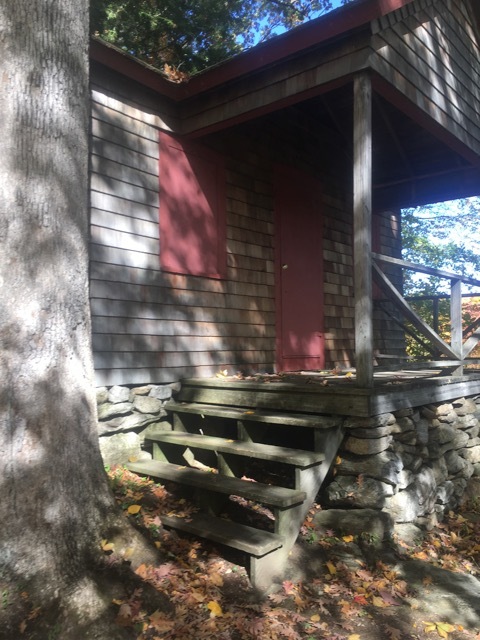 There was a picnic table and a fire ring, and the privy and tent platform were indicated by a sign to be to the south, just towards the mountain’s edge. I didn’t go to check those out but I’ve seen photos of the platform which is right near the edge and has a fantastic view if you get there first. Just don’t be too groggy or clumsy when tenting there. There looked to be what was a stream behind the shelter but there was nothing in it and in fact the water source was .25 miles down the hill from the platform area. I have read its not a whole lot of fun to get down there for water and then back up, but its better than no water. I forgot to mention there is also a bear box. I signed the register and took some photos and then we headed out of the gorge the shelter sat in. 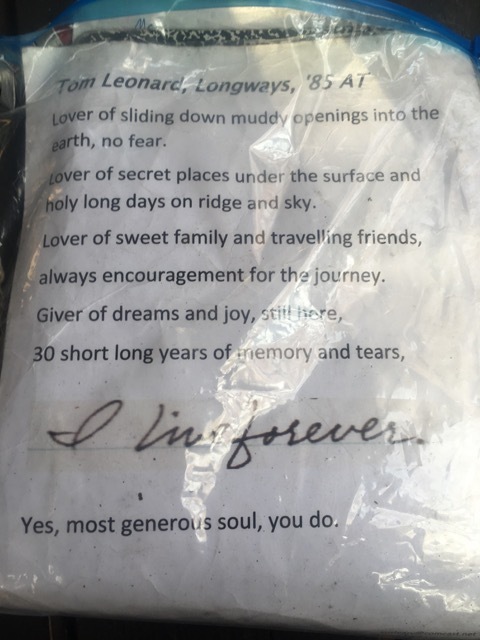 In the register book is a poem about Tom Leonard “Longways,” who thru hiked the trail in 1985. 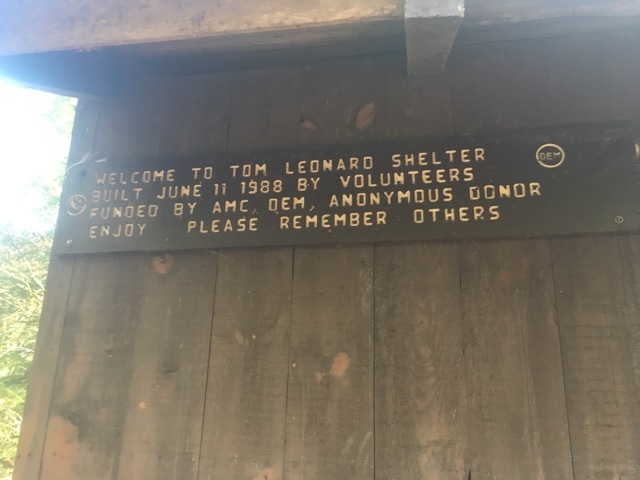 This shelter was built in 1988 in dedication to him. I’m going to assume he passed away, I’ll have to look it up. There’s a few ways in and out of the shelter on blue access trails and I’d read it could be confusing but really it wasn’t. Regardless, I just went back up the way I came. We met a day section hiker and followed him along the rock walls to the ice gulch ahead. This is an impressive feature. A large gulch is carved, obviously from water, into a notch between this mountain and a smaller knob on the other side. The trail follows along the dry gulch for a few tenths of a mile but its truly a sight to behold. While there is no water, you could feel the cooler temperatures and it got its name from the fact that its so cool down there you can even see ice in the summer time. 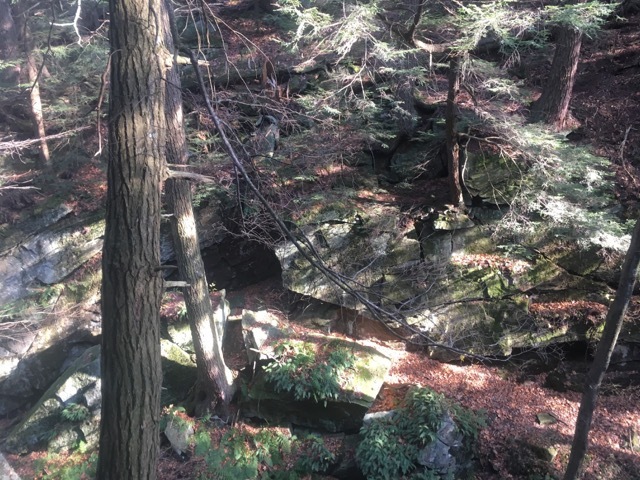 The trail then descends along the eastern slope of Warner mountain, whose edifice rises up to the west over Hemlock forests. 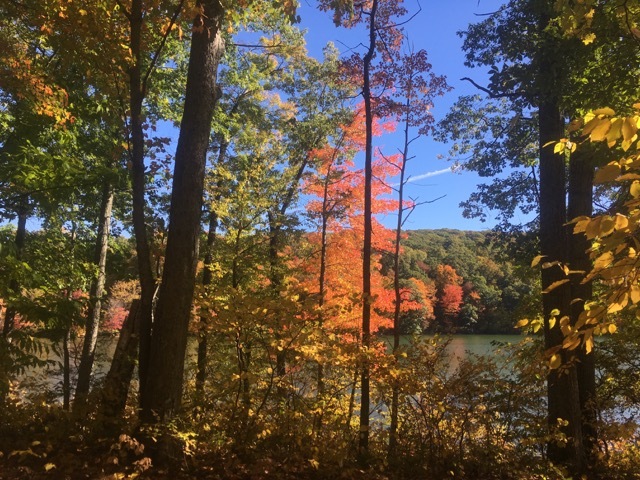 It then gently descends through these forests and crosses Lake Buel road, a small inlet from the lake covered in towering cattails, and eventually reaches route 23. We were hoping to see the lake, and on a thru hiker video he was at the lake, but you need to walk down that road a quarter mile to reach it. 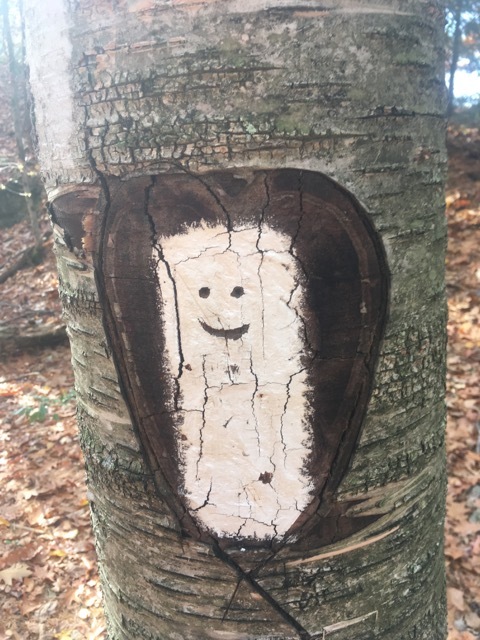 Tell me that doesn’t look like a bear! If it was summer that probably would have been on the agenda. We did however hear drums and smell incense as we approached that road. We knew there was a spiritual retreat in the area on rt 23, but it was in fact coming from the lake. We were still a mile from 23. 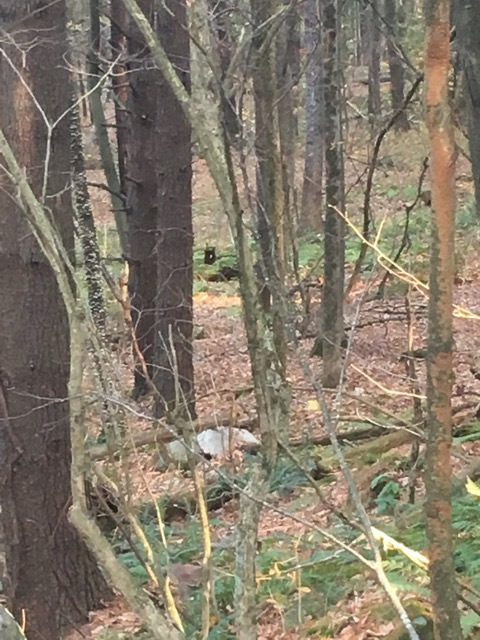 On the walk from Lake Buel Road to 23 we saw something in the woods that for a good 5 minutes we thought was a bear staring at us from the distance. We stopped and looked and made noise. It didn’t move, not one bit. We ultimately deduced that if it was a bear it would have scurried off or at least moved. That was one bearly tree stump! We laughed and got some pictures, no longer concerned. The inlet was a good sized water source, and the only one we saw since I didn’t make th trek down to the shelter source. So if you’re heading south through here, you can rely on that one. We reached the lot at 23, at the gateway to Great Barrington and the Beartown state forest. 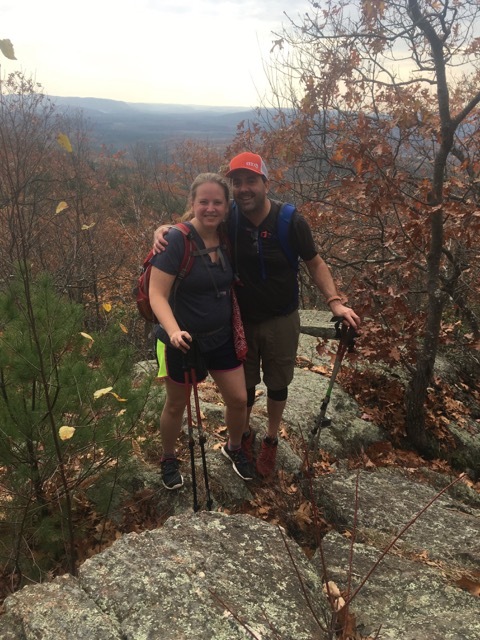 We hadn’t planned on being back up this way until spring, so even though we were just hiking for the day, I felt content to have covered another section of Massachusetts I was really looking forward to, and finishing off another section. Just under 1/3 of the state is now complete! 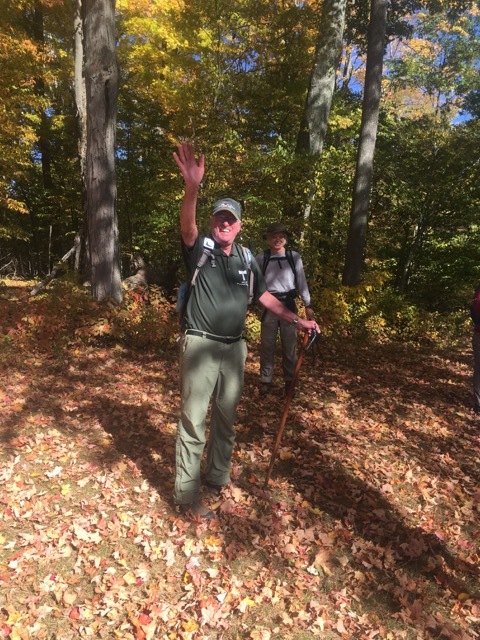 Next spring we will do our first overnight on the next section on Mt Wilcox in Beartown state forest. There are two shelters here, and a campsite. We should be able to cover the whole 12-mile section with a shelter right at the halfway mark. 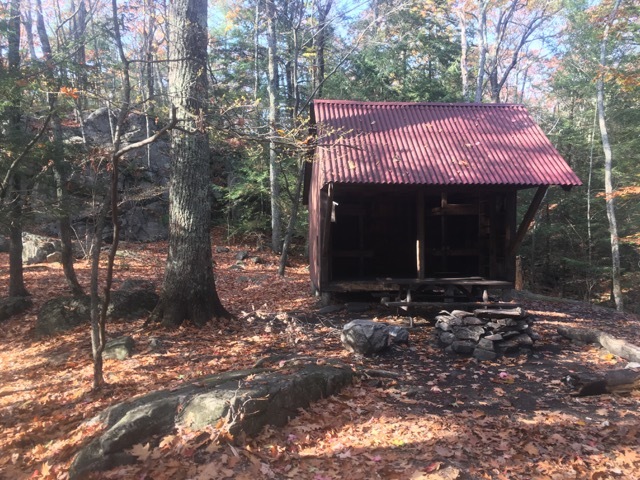 From there its just 6 miles north to Upper Goose Pond cabin and its famous breakfast for hikers. So we will probably push that out a bit to early summer so we can enjoy it properly. Maybe we will do the next section and come back. I’d like to canoe on the lake as well, so I want it to be fairly warm. GB is an Appalachian Trail Community, and a great town! This was also the section we were going to take the kids on in September. But I think we made the right choice to do a section with them we already knew. 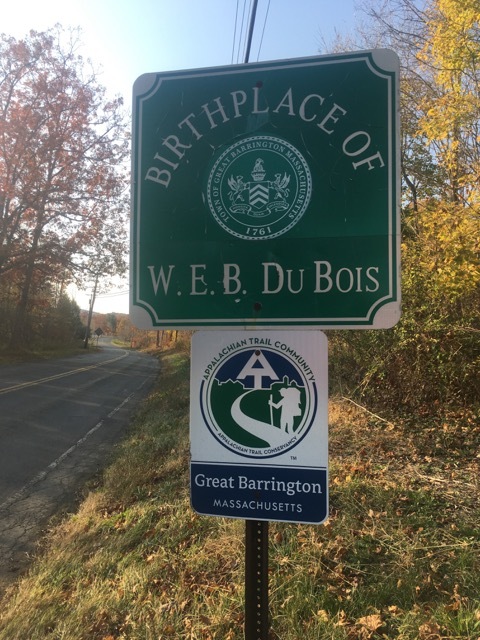 They love Great Barrington as much as we do, so now that we know they will have no problem with this section that’s probably their next one with us. Oh my how the time has gotten away from me, I have to get ready for work! But I will be out on the Connecticut trail tomorrow doing my trail patrol and mostly cleanup. Maybe I’ll see you! 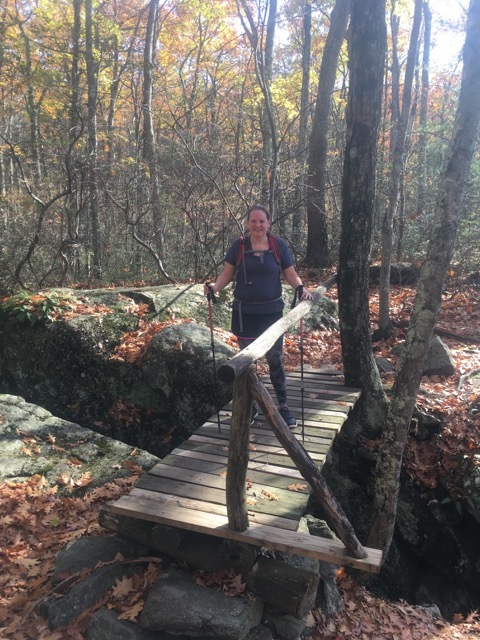 Yesterday we got to do another section of the Massachusetts Appalachian Trail. It was a beautiful section with peak fall foliage, and that report is to come. But first I wanted to take an opportunity to talk about our wonderful Appalachian Trail Day last month. This October was the 10th anniversary of this occasion. The foliage was just starting to hit peak in Kent a few weeks ago. 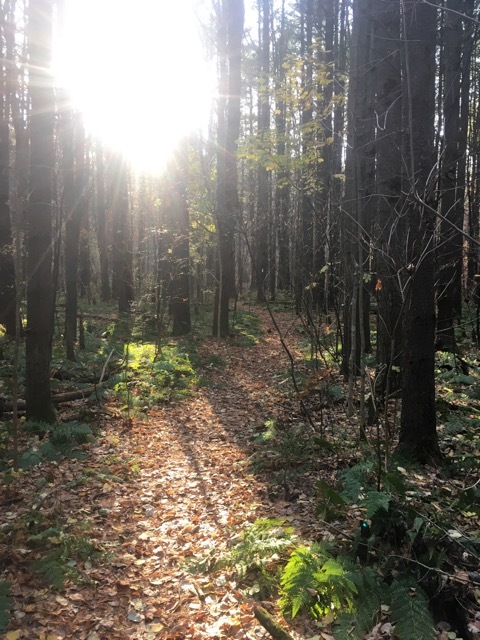 In the morning I stopped at the grocery in Kent and met a trail angel who one of my friends in the trails committee had met earlier in the week and posted a photo of. She had forgotten to invite him to our BBQ this afternoon, so I went over and introduced myself and chatted with him and a hiker he was with and then invited them both before picking up my groceries and heading to the trail head. 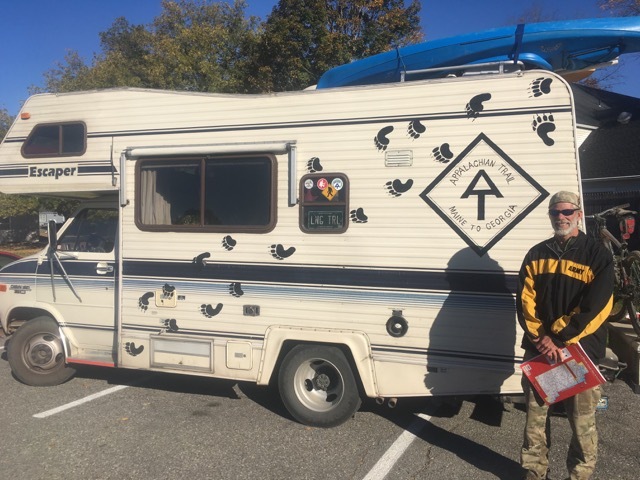 He travels up and down the trail in his awesome RV which he has adorned with the A.T. logo and some bear and human tracks. He does hiker feeds, shuttles and lets people stay in his R.V. when the weather is particularly bad or they just need some creature comforts to raise morale. I could not remember his complicated trail name; it was something very Lord of the Rings-like. But he did tell me his real name too. It was great to meet him and thank him for his taking such good care of the hikers. He had completely lost track of what day of the week it was. God I envy that. Anyway, originally this day was called the A.T. ‘marathon day’. 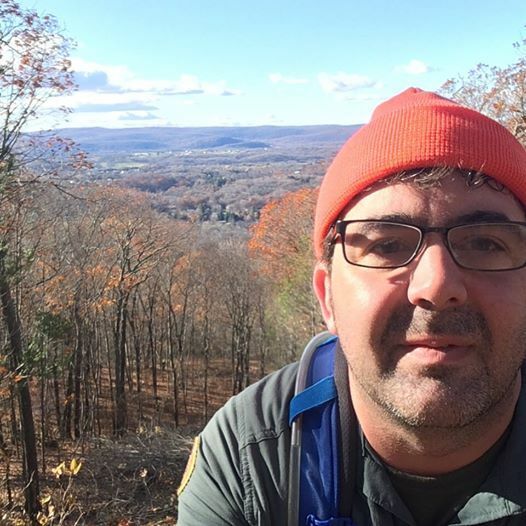 This is because members and maintainers would do a series of hikes to cover the whole Connecticut section in one day to find any issues. They even did it relay style at one time. At the end of the day they would gather to report all their findings and have dinner or a social hour. 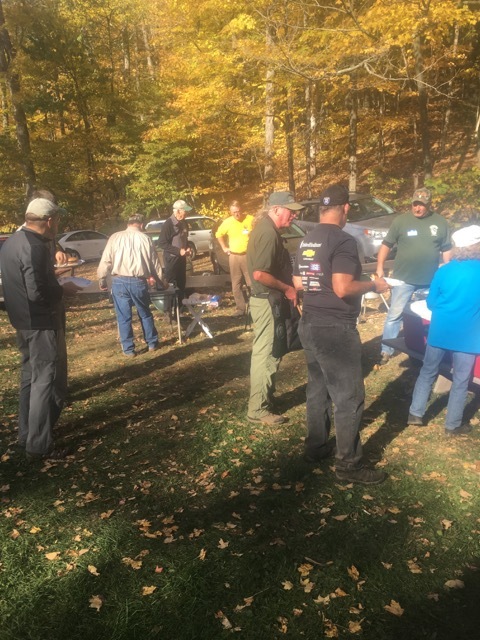 We still cover the whole trail each year as part of the day’s events and then celebrate after with a BBQ in Macedonia Brook State Park, where the A.T. once passed through. Learn lots more about this event’s long history on page 3 of our latest newsletter! 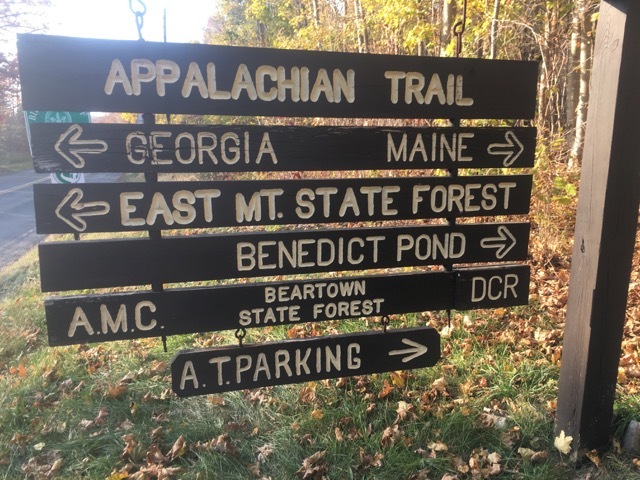 In addition to the A.T. hikes there are hikes in other parts of the state. There are also trail work parties, paddling trips and rock climbing lessons at St. Johns Ledges here in Kent. In the past on A.T. day I have joined in work parties to re-paint the white blazes, and also assisted in trail patrol training. This time I joined members of our trails committee on an ‘A.T. history hike’ through another previous part of the trail through Pond Mountain natural area just east of Macedonia State Park. We parked in the lot on Fuller Mountain road, having done a great deal of the climb on our drive up. From the lot the route we took dropped quickly back down to where the trail originally traveled, and then shortly but steeply along another road which the A.T. now crosses farther up and which we would cross once more from that direction on our way back. 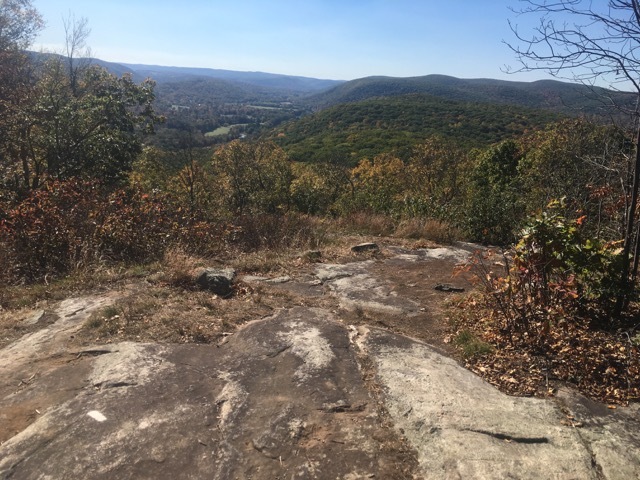 When we re-entered the woods, we were headed up the back side of Caleb’s Peak which has a favorite view in this area, with the Housatonic river valley stretched out below and the town of Kent in the center. 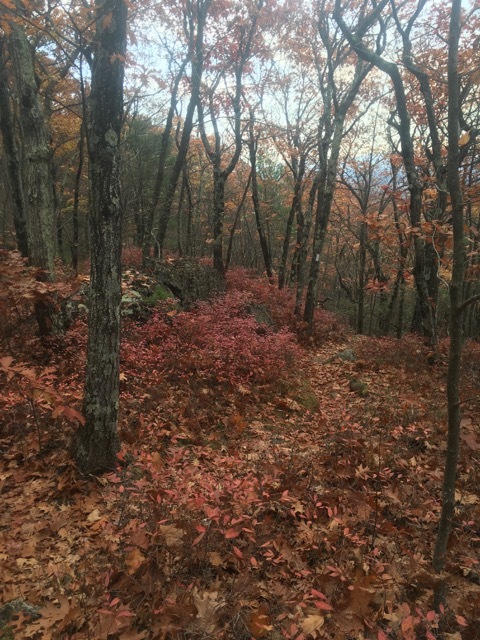 Years ago when we first finished Connecticut, we saw the purple blazes for this section and did not know what they were. In fact nobody knew who actually blazed them. But as of late, the AMC will be taking it over, maintaining it and making it an official blue-blaze trail. On Caleb’s Peak we gathered for a snack to take in the views. Someone had made a very large fire ring and we saw a couple using a small wood stove in the fire ring. I asked them if they were responsible for the larger ring and fire and they said they were not but asked if it was ok to use their wood stove in there to contain any embers. Technically these are allowed. I reminded them that on their travels through the state that no campfires or fire rings allowed. We then went about the business of clearing the ring. It took several of us to lift the large rocks and some of the embers were still burning. Since I didn’t have my gloves I got a small burn on my finger. We decided it was best to leave them to cool as scattering them with everything so dry would have been dangerous. It seems people really like to challenge our rules here. This was a very large ring in a very visible spot, and they didn’t even make sure it was out before leaving. Just 1/4 mile south of here is the remains of a brush fire started by this exact type of behavior. You can see the scorched tree trunks and downed trees. How can you see that and then go and make a fire in an illegal spot right up the trail? People just don’t think about the consequences, even when they’ve just seen them. After our snack we headed back down the A.T. towards Skiff Mountain road where we would then re-enter the Pond Mountain area. 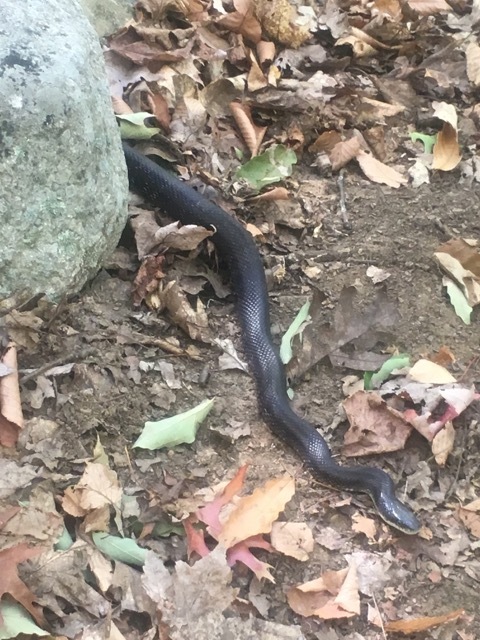 On the way down we spotted a very large black racer snake and all enjoyed watching him as he crossed the trail and headed back into the woods. He was at least 4 feet long! We also passed that brush fire site which surprised many of the people on our hike. Seeing what happens from irresponsible behavior first hand is a very good way to learn why we have these rules in place. Luckily the forest seems to be recovering well. We also went down the new stairs that our trails crews built over the last season and admired all their work. We talked about how they fly in and lower the rocks on cables to transport them. The stairs look great, thanks guys! Once back in the Pond Mountain area, we followed an old carriage road trail until we re-connected with the trail up to the lot. It was steep, though wide and flat and a good last workout! Though our hike didn’t take us to the summit, there is a mountain trail which I will check out on another day. We got to the barbecue and got the grills fired up. I ordered my usual ‘hockey puck’ burger and enjoyed a cold beverage. Our trail angel friend was there parked in the lot so I talked to him a bit more. 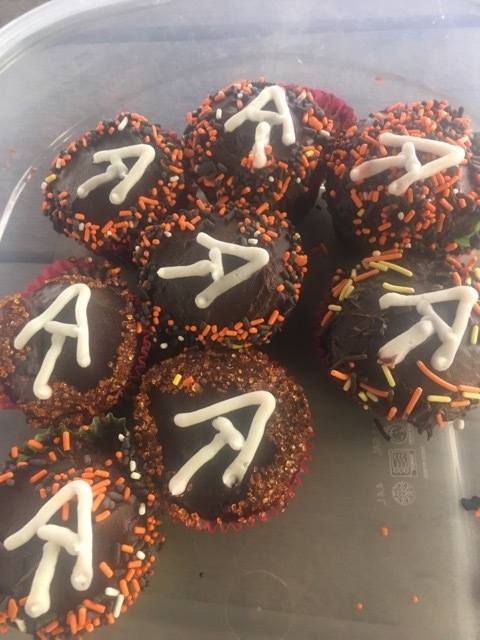 We enjoyed hot dogs, hamburgers and lots of other snacks including these wonderful A.T. cupcakes made by one of our members. I caught up with some other friends from the club who were on different hikes that day and then eventually had to get going back to real life. But this event is always a fun one. Whether you’re a member or not you are welcome to join and we all pay just $6 for the food and drinks. Its a great way to introduce people to our organization and share our love for the outdoors and for protecting it. I hope to see you next year at A.T. day! There are also many other work parties throughout the year where you can take part and give back to the trail. Visit our website here. Click on the ‘trails’ link in the navbar up top to find a list of all of our upcoming work parties and see how you can get involved.